Sean has drawn caricatures all over Ohio and beyond from 1995–2015 and all over Southern California from 2015–2018. A leading caricature artist from Central Ohio, some of Sean's past clients included The Ohio State University, The Ohio Attorney General, and the Greater Columbus Sports Commission. He was also highly sought after for weddings receptions. After 23 years of providing professional caricature entertainment for virtually every kind of family-oriented event, Sean has a wealth of experience with logistics and will put that to work for you, to help your event run smoothly and your guests to be delighted. More about Sean: As a fourth grader in 1983, Sean's interest in caricatures began when he purchased a book, The Art of Caricature, from the Allentown, PA art museum. Soon after, Sean was copying other caricatures from TV Guide magazines and drawing his own caricatures of political and entertainment figures such as President Reagan and Magic Johnson. In 1992, he accepted a scholarship to the Columbus College of Art and Design in Columbus, Ohio. 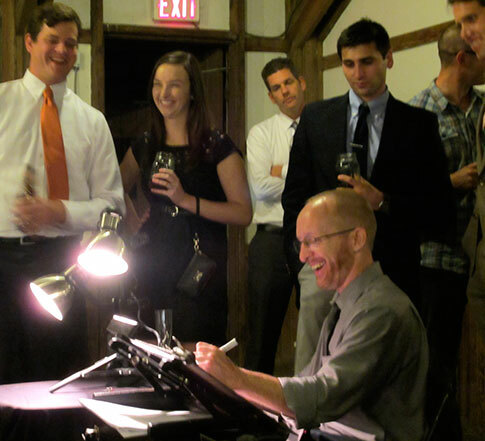 While a student, he landed a summer job doing caricatures at Cedar Point Amusement Park. While many others found this job to be just another summer job, it was the beginning of something more for Sean. Since then, Sean has drawn all over Ohio for numerous events and festivals and he has provided gift caricatures and digital logos for clients all across the country and overseas. A common saying overheard at an event where Sean is drawing is, "It really looks like them!". Sean takes great pride in capturing a likeness and providing professional entertainment for every event he is a part of.